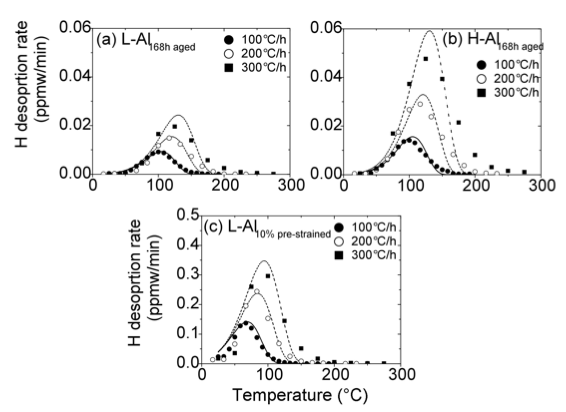 The trapping of hydrogen at a variety of sites in multiphase transformation–induced plasticity (TRIP) steels has been characterised using thermal desorption spectroscopy and the results have been modelled using diffusion theory. It is discovered that austenite serves as a reversible trapping site which is more potent than grain boundaries or dislocations in ferrite. Plastic deformation which leads to the partial martensitic transformation of the austenite results in an alteration in the trapping condition of the inherited hydrogen. It is demonstrated that these phenomena can be incorporated into a mathematical model which permits the desorption of hydrogen to be predicted quantitatively as a function of, for example, the heating rate, phase fractions, and phase transformation. An interesting outcome is that the mechanical degradation of the steel by hydrogen is more pronounced in TRIP steel containing austenite which is relatively less stable to martensitic transformation during deformation. This is because the phase transformation causes a reduction in the trap binding energy, thus enhancing the apparent mobility of the hydrogen.